Anastasia Loukaitou-Sideris is the Associate Provost for Academic Planning at UCLA and an Urban Planning Professor at the UCLA Luskin School of Public Affairs. Professor Loukaitou-Sideris’ research focuses on the public environment of the city, its physical representation, aesthetics, social meaning and impact on the urban resident. Her work seeks to integrate social and physical issues in urban planning and architecture. An underlying theme of her work is its “user focus”; that is, she seeks to analyze and understand the built environment from the perspective of those who live and work there. 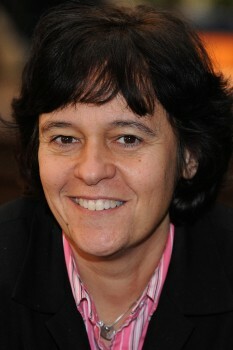 Dr. Loukaitou-Sideris’ research includes documentation and analysis of the social and physical changes that have occurred in the public realm; cultural determinants of design and planning and their implications for public policy; quality-of-life issues for inner city residents; transit security, urban design, land use, and transportation issues. Recent and ongoing projects, funded in part by the U.S. and California Departments of Transportation, the Haynes Foundation, the Gilbert Foundation, and the Mineta Transportation Institute, include: an examination of the privatization of public open space in major American downtown areas to document the effects of redevelopment on their built form and social context; documentation of varying patterns of use of neighborhood parks among different ethnic groups; proposals for the physical and economic retrofit of blighted inner city commercial corridors, examination of the impacts of new rail transit lines, creation of guidelines for the development of transit station neighborhoods; studies of transit security, and planning for parklets. She has served as a consultant to the Transportation Research Board, Federal Highway Administration, Southern California Association of Governments, South Bay Cities Council of Government, Los Angeles Neighborhood Initiative, Project for Public Spaces, the Greek Government, and many municipal governments on issues of urban design, open space development, land use and transportation, and she has been commissioned to author research papers by the National Academies and the Robert Wood Johnson Foundation. Dr. Loukaitou-Sideris is the author of numerous articles, the co-author of the books Urban Design Downtown: Poetics and Politics of Form (University of California Press, 1998), Sidewalks: Conflict and Negotiation over Public Space (MIT Press, 2009), and Transit-Oriented Displacement or Community Divided? (MIT Press, 2019); and the co-editor of the books Jobs and Economic Development in Minority Communities (Temple University Press, 2006), Companion to Urban Design (Routledge, 2011), The Informal American City: Beyond Taco Trucks and Day Labor (MIT Press, 2014), and New Companion to Urban Design (Routledge, 2019). New York and London: Routledge (2011). Loukaitou-Sideris, A. and Ehrenfeucht, R., MIT Press (2009). Ong, P. and Loukaitou-Sideris, A. (Eds.) Temple University Press (2006).